During the Athletics’ third season at the Jefferson Grounds, alarms were raised over the possibility that the site would be sold to housing developers. The Athletics’ directors were upset because they claimed to have invested over $7,000 on the ball field. After much debate and lobbying the politicians relented and the sale did not go through.10 A subsequent concern was the building of additional cheap seats in the outfield. In 1874 this need intensified when the grounds welcomed a new tenant, the Philadelphia Centennials (also known as the Quakers or Fillies). The new club had the field every Monday and Thursday. The Athletics took the site on Wednesdays and Saturdays.11 Prints of the playing grounds from a home plate perspective portrayed a wooden porched-styled construction.12 In spite of the clubs’ successes the ball park was losing money. The tenant teams compensated by raising ticket prices and erecting a new interior fence that could be plastered with paid advertisements. But the prevalence of gambling and drinking at the ball field kept people away.13 Eventually, the expenses of park maintenance and renovation exceeded revenues. They could not even afford a tarpaulin to cover the infield.14 It was hoped that the Athletics’ affiliation with the new National League in 1876 might save the old ball field. But the well-worn Jefferson Park did not appeal to fans and with low income and poor attendance the Athletics could not afford to remain in the new League. 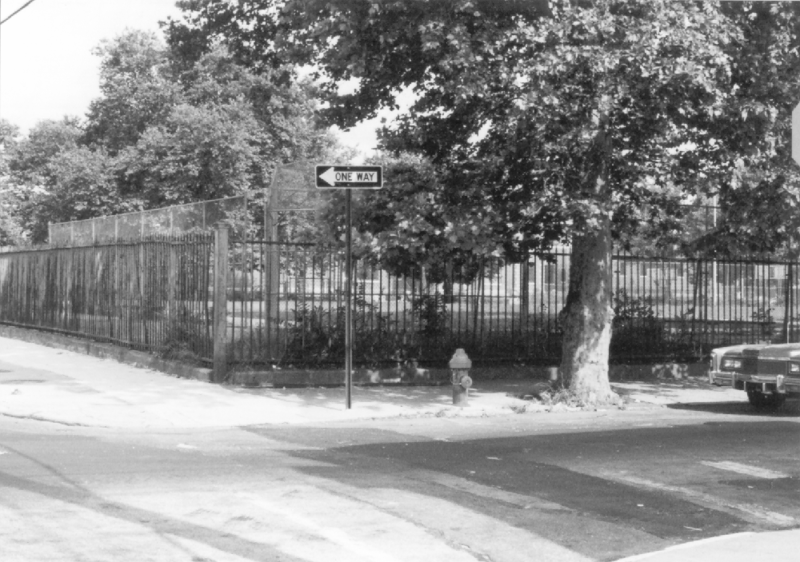 The unaffiliated and homeless Centennials now shifted their games to Recreation Park at 24th Street and Ridge Avenue, and the expelled Athletics’ rump team in 1877 played unsanctioned games wherever they could find a ball field. It was obvious that more revenue could be made by turning part of the Jefferson Grounds over to residential developers. It took the creation of the American Association in 1882 to revive the Athletics and the old Jefferson Park ball field. The Athletics initially played their inaugural Association season at Oakdale Park at 11th and Cumberland. This leisure recreation site had a large lake and an adjoining playing field, used earlier for cricket. 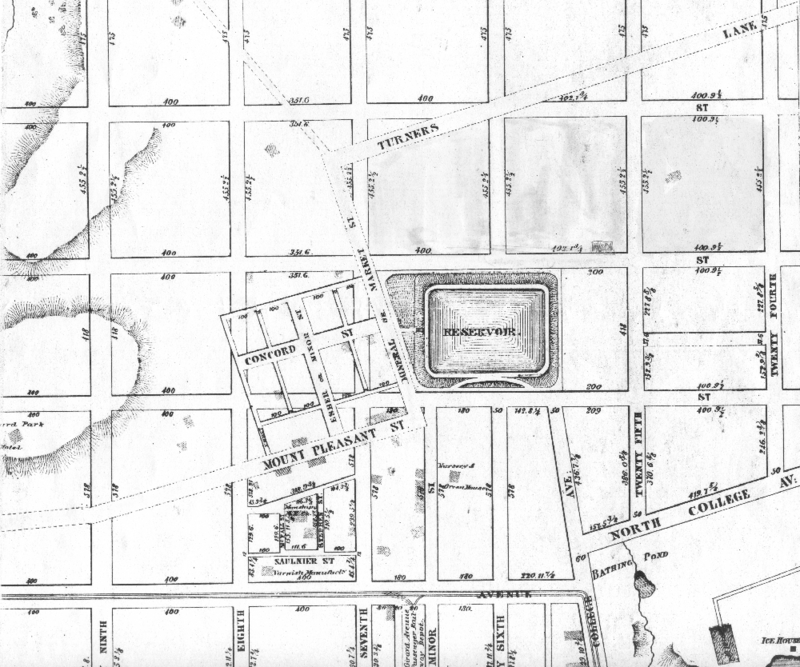 Some distance from the Jefferson/Columbia ball-playing corridor, the Oakdale grounds had been in use since 1866.15 After nearly a decade the ball field became downtrodden until the displaced Olympics revived the grounds [1877–1881]. It was thus an ideal place for the revitalized Athletics to re-establish themselves. The Athletics began the 1886 season with an advertisement claiming to be the “oldest playing organization in the United States.” They asserted that they gave the Jefferson Street patrons “honest ball playing” when they posted the opening season schedule of games. These contests began at 4:00 pm and admission remained at 25 cents. Even the train schedule from Broad Street was publicized.23 Despite this confidence, the ballfield was again threatened by city officials. These ambitious politicians were deterred when they were reminded that no one except the Athletics was willing to pay the $2,000 lease for the grounds.24 Once this issue was settled the Athletics re-dedicated their resources to repairing the grounds. They raised the infield, put in new cinder paths, and purchased “an immense canvas to cover the entire infield.”25 Two years later, Mason and Simmons, looking for revenue, changed the ticket prices. General admission became 50 cents, and for an extra quarter women and their escorts could sit on cushioned seats in parts of the grandstand.26 This new revenue was intended to cover the expenses of erecting a new fence, replacing old floorboards, and re-painting the pavilions.27 In spite of these changes, the growing threat of a players’ strike put the Athletics and their ball park in jeopardy. In 1890, the players’ Brotherhood union brought a player strike team to Philadelphia. This anticipated rivalry moved the Pennsylvania Railroad to offer the Athletics a new ball field at a more competitive location with easy access from the Broad Street Station. It was rumored that the club was offered a five-year free lease if they moved to a site in West Philadelphia on the other side of the river below the 40th Street Bridge.28 Rather than lose or alienate their existing fan base, the Athletics turned down this speculative offer. Instead the Athletics, in grounds which had not been updated in a number of seasons, prepared for the 1890 strike season, competing against two Philadelphia ball clubs in different leagues. The season, as expected, was a hardship for the American Association Athletics. Attendance waned and expenses mounted. By the end of the year the Athletics had new management and the Jefferson Street grounds were on the verge of being eclipsed. By the middle of the strike season the Athletics were plagued by pre-existing financial woes. In 1888, this condition moved Mason, Simmons, and Sharsig to seek new investors, like H.C. Pennypacker and his partner William Whitaker. But during the season of 1890 the club’s problems mounted. In one instance, a suit for almost $300 was brought against the franchise in the Court of Common Pleas by carpenters who were not fully paid for their work on the pavilions.29 The ball club also owed $1,200 in back rent and $1,435 for lumber purchases. To pay these outstanding debts the grandstand, inside fence, seats, flagstaff, ticket boxes, and office furniture, appraised at $765, were sold at the end of the season for $600.30 Sometime during these dealings, the Wagner brothers, J. Earle and George, wholesale meat distributers, took over the defunct franchise. Previously, the Wagners were stockholders in the city’s Players League team. After the Jefferson Street field’’ sheriff sale, the Wagners shifted players from the three city ball clubs and set up their reconvened team at the Players League ball field, Forepaugh Park and Broad and Dauphin Streets. Today a memorial plaque to Billy Sharsig is mounted at the 26th Street recreation center and kids play on a softball field set on the grass and dirt of one of Philadelphia’s oldest and most important ball playing sites. DR. JERROLD CASWAY is the Dean of Social Sciences at Howard Community College in Columbia, Maryland. He is the author of "Ed Delahanty in the Emerald Age of Baseball" and has completed, "The ‘Olde’ Ball Game: The Culture and Ethnicity of Nineteenth-Century Baseball." He has written many articles on the early game and has frequently spoken at the Hall of Fame’s Nineteenth-Century Symposiums. He at work on a history of baseball in Philadelphia from 1832 to the building of Shibe Park. 1. Sunday Dispatch, March 27, 1859. 2. Sunday Mercury, May 16, 1866; Sunday Dispatch, March 3, 1872. 3. Ibid., May 22, 1864; Philadelphia Inquirer, May 25, 1864. 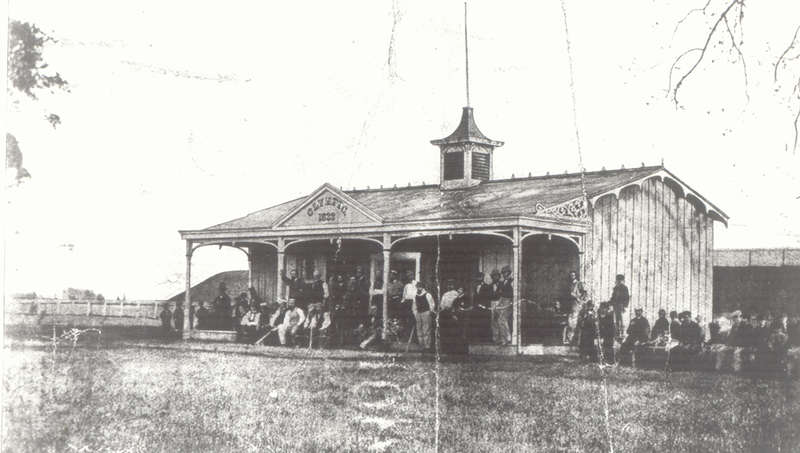 Olympics club house, c. 1866. Baseball Hall of Fame Library, Olympics Folder, B 13.55. 4. Evening City Item, May 15, 1871. 5. Painting by A. Kollner, 1865 in Logan Library, Philadelphia, PA. See also T. Eakins painting, 1875, “Baseball Players,” at Rhode Island School of Design, Providence, Rhode Island. 6. Sunday Dispatch, September 15, 1872; 11 June 1871; Philadelphia Inquirer, April 11, 1871. 7. Sunday Dispatch, April 7, 1873. 8. Ibid., November 21, 1871. 9. Ibid., April 7, 1872; April 28, 1872. 10. All Day City Item, May 23, 1873. 11. Sunday Dispatch, January 25, 1874. 12. The Daily Graphic, April 30, 1873; April 18, 1874. 13. All Day City Item, February 10, 1875; February 28, 1875; May 3, 1875. 14. Ibid., July 30, 1875. 15. Sunday Mercury, November 4, 1866. 16. Sunday Item, March 26, 1882. 17. By the end of the first year the Committee on City Property gave the Athletics a three-year renewable lease at $2,000 a year. This agreement stood unless the new high school was built. In that case the city had to give the ball club a three month notice of the forfeiture. Sunday Dispatch, December 9, 1883. Philadelphia Press, January 17, 1883; Sunday Dispatch, February 4, 1883. 18. Sunday Item, April 8, 1883; April 1, 1883. 19. Ibid., April 8, 1883; Sunday Dispatch, January 14, 1883; Philadelphia Record, April 1, 1883. 20. Ibid., March 29, 1883. 21. Frank Leslie Illustrated Newspaper, October 6, 1883 and Gilbert & Bacon picture, 1884, Baseball Hall of Fame, B. 164.65. Philadelphia Record, March 29, 1883; March 31, 1883. The late Larry Zuckerman calculated that the ball park’s dimensions were 288–440–352. Zuckerman to J. Casway, August 7, 1999. 22. North American, August 28, 1899; May 5, 1893. Philadelphia Inquirer, October 10, 1898. 23. Sporting Life, March 31, 1886. 24. Ibid., May 5, 1886. 25. Ibid., November 17, 1886. 26. Ibid., April 25, 1888. 27. Ibid., February 20, 1889. 28. Ibid., October 16, 1889; Sporting News, October 19, 1889. 29. North American, June 26, 1890; Sporting Life, June 28, 1890. 30. Ibid., October 18, 1890; The Sporting News, October 18, 1890; Cleveland Plain Dealer, October 15, 1890. 31. Sporting Life, November 28, 1891. 32. Ibid., December 12, 1891. 33. Ibid., June 18, 1892; Sunday Item, June 19, 1892; The Sporting News, October 27, 1894. 34. Sporting Life, October 27, 1894. 35. The Sporting News, September 23, 1900; November 24, 1900. 36. Philadelphia Press, December 20, 1900. 37. Ibid., May 13, 1901; Sunday Item, May 11, 1902.